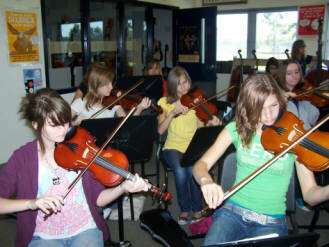 We give musical instruments to schools. 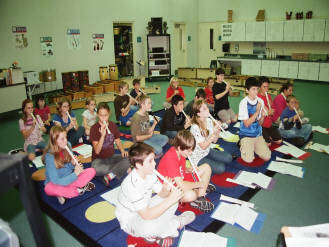 The schools in turn make the instruments available to students whom may not have an opportunity to play an instrument. 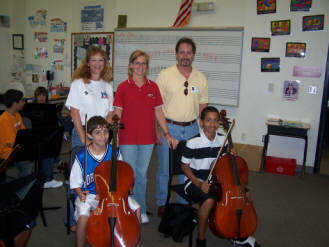 To date we have donated more than $230,000 worth of instruments to approximately six local schools in Sarasota and Charlotte counties. We enjoy receiving feedback from teachers telling us how our donations have impacted their students. 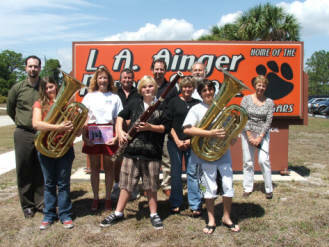 FAME helped put Ainger Middle School's band program on the map! I started teaching at Ainger twelve years ago. I was shocked to see a complete lack of instruments in the school inventory. I was hired to build a successful program, recruit, and inspire kids to love and make music. That would have been impossible if FAME didn't come in when they did. We have been extremely blessed to have such TREMENDOUS community support and have passed music on to many kids that would not have been able to afford to play an instrument. Music teaches the whole child. Our friends in FAME get that. F.A.M.E. began in the summer of 2006 when two friends, Jim Pivovar and Barry Bianche, were discussing how music has influenced many lives, including their own. It was through the appreciation of music that Jim and Barry met, as Barry played bass in a band, and Jim was enjoying the music. During a discussion they decided they would like to give back to the talented musicians in their community. "We appreciate the time and talent our local musicians give to people who are in need," says Jim. "They are always donating their time, and we want to say, 'Thank you for your generosity.'" So, Jim and Barry came up with an idea to develop a promotional calendar highlighting local musicians. This project evolved into a fundraising endeavor to help the next generation of professional musicians. "At first, we were out there to support local musicians," says Jim. "Then we realized just how passionate we were about this mission. 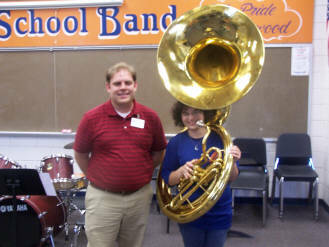 We looked around us and became aware that we had met all of our friends through music." 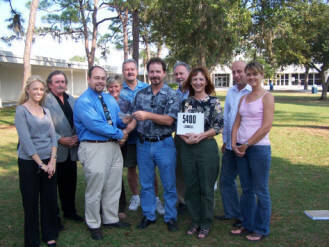 Their first calendar was released in 2006, "FRIENDS, Music Brings us Together," which celebrated the year 2007. After selling their first calendar publication they asked, "What are we going to do with this money?" With the success of the past four years, the event demanded a larger venue. It became increasingly challenging for F.A.M.E. to find a location that would accommodate the large crowds that were attending the event. After searching for a local venue, obstacles kept presenting themselves, and they landed at Oyster Creek Park on San Casa Road in Englewood. To be quite frank, attendance for this event dropped off because of the severe change in location. But, loyal supports forged on, and began planning 2011. Ten band-in-a-box sets were donated to Adventures Preschool. A three-day block party was established on Dearborn Street. 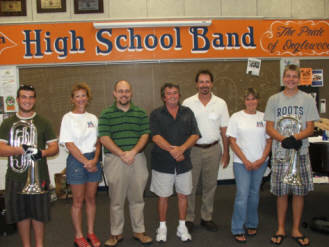 Their second calendar (2008) was published as "Mentoring Thru Music, Play it Forward." The three-day music festival was held at Pioneer Park on Dearborn Street where $8,200 was raised and donated to L.A. Ainger Middle School in Englewood. Many of their friends were watching their philanthropic gesture, and suggested that a fundraiser be developed to further their mission. In December, 2006, they held their first three-day music festival at Coconut Grove (now Englewood's on Dearborn). All bands that played at the festival donated their time and talent. This tradition would be the cornerstone for future events to raise money for the kids. With a team of passionate people, $5,400 was raised. They decided the best way to appropriate the funds was to help out the next generation of musicians. 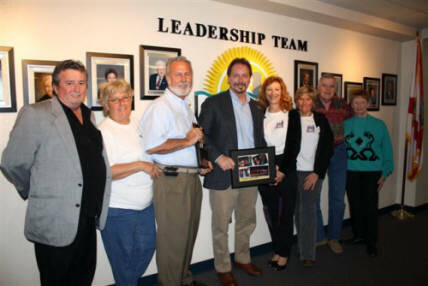 And to do so, they donated the proceeds to Lemon Bay High School in Englewood.